Online IGA Catalogues with local foods, supermarket deals including half prices and great discounts, shopping advice for the week and savings. Regular updates of the retailer are available on this page. The range of IGA supermarket covers our favourite brands of snacks, grocery products, fresh meat, fruits and veg, soda packs, soft drinks, breakfast food, and much more. Australia’s one of the most popular grocery store publishes weekly catalogues. Read the weekly specials to beware of the discounts and never waste your money on expensive foods. You can always check this page for the future Iga Catalogues but alternatively, follow our social media accounts and get the latest deals as notifications. In addition, there might be more than one catalogue so that it’s optional with a select box on top of the catalogue page. February Iga catalogue deli fresh food and bakery products can be viewed on the pg; 6&7 of the latest Iga online catalogue. A real nice range of the products for average prices of the Iga are present here for you to view the best of shopping on internet. Don't miss out the Iga products of fresh meat. Lamb, minced beef, chicken breast and more products of fresh meat department can be found at Iga. Stores of online Iga products will have your money in your pocket. 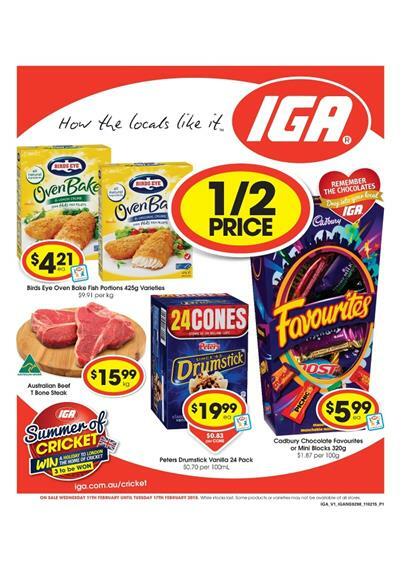 Iga food offers from Iga Catalogue February are available here. Please go to pg; 2-3 for the beverage, nutritional sweet tastes and summer food of Iga. The retailer doest this shopping catalogues pretty well to guide you to have the best deals for low values. Personal care items and petfood can be found on pg; 4 of the Iga supermarket catalogue online. Breakfast products like Sultana Bran and Coco Pops can be purchases for the reduced values. Iga online catalogue February offers a fine meat range. The true quality emerges when you compare this product range to those of other supermarket catalogues. Iga Online catalogue February offers are available on the preview page with all prices. Mixed products of meat varieties appear on the meat department's exclusive product range on the pg; 3. Delicious and healthy bakery products of IGA are also among IGA online catalogue February offers. Snowballs, toasts flavored with fruit, sponge rolls filled with delicious jam, ginger kisses are featured on this catalogue. Soft drink varieties from IGA stores are on pg; 9. The brands online customers love are featured and the price range will not be effective after tomorrow. Schweppes, Solo and similar brands are available. Iga also offers good range of canned foods. And small snacks that we love to have in our cabinets are featured on this catalogue. See the new variety of the food products at Iga. Personal daily care products like toothpaste, Dove shampoo, Nivea creams are deals of this week. Iga prices on this catalogue are waiting for customers until 9th February 2015. An excellent featured Iga Catalogue online fresh food products range is possible to read on preview page. You just click on the image of the first page of the catalogue here and it will direct you to catalogue preview page. This week we can browse fresh meat products with new prices. These are current prices of the Iga supermarket. On pg; 2-3 fresh meat of lamb chops, steak and similar and fresh food like pears, apples appear. Also Bakery range is available on latter pages. See pg; 5 for the detailed information of bakery products. Dairy products like yogurt, juice varieties and more products can be found on pg; 6&7. Latest deals of the beverage products featuring Pepsi, Schweppes, Solo are available with new prices. 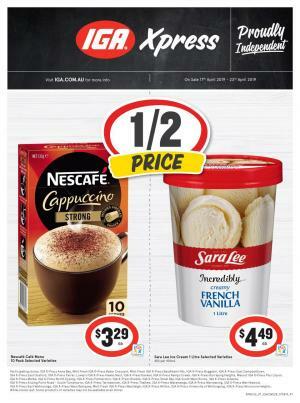 Current deals for the Iga Catalogue beverages are on pg; 9. Lunch boxes are main products you can find at Iga stores for new semester of school. Also small packed food varieties and juice varieties for lunch of kids are featured. More than these products are possible to shop through 10th February 2015. Iga snacks products, confectionery and similar sort of appetizing items can be seen on pg; 13. There is a classic range of snacks such as Doritos chips, Nestle chocolates, Cadbury Milk Tray and more popular snack products. Iga Catalogue generally advertises products of local food varieties, general known brands of beverages and confectionery, chemical cleaning supplies like Fairy dish washing liquid and simple needs of your shopping weekly. Last week's catalogue was mainly focused on the half price range. They also got this half price range which allows you to reach the best deals of food. With this way everyone saves a lot instead of spending bigger amounts. You can find a lot more supermarket products on this website. Iga is that kind of retailer offering simple food products among these discount stores. Most trusted products can be found at IGA stores. Catalogues are the main helps to discover these kind of products. This week's catalogue will be updated here soon. Don't forget to follow these posts to be aware of. Iga offers seasonal food varieties at their grocery department. In-store you can easily find it. Fresh food is also another type. They also have recipes for slow cooked roast and BBQ sandwiches this week. Find them with a video featured on the official page of main site. For celebration food are advertised on the main page. See main courses and side dishes for this holiday. IGA is also helping you cook better.